TORONTO, ON – Amsterdam Brewery has announced the details of ninth installment in the Amsterdam Adventure Brews series of limited edition beers. 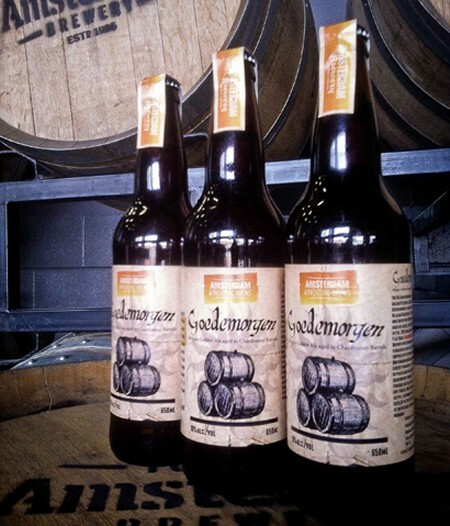 Goedenavond was the same Belgian Golden Ale base as Goedemorgen, but was aged in Pinot Noir barrels and sold out in December of 2012. Goedemorgen has been aging for 1 year in local Flat Rock Chardonnay barrels until we bottled it up last week. Brettanomyces contributes an earthy funkiness that is balanced by peach and pear notes from the chardonnay barrel. The beer finishes with a slightly tart and dry finish. Unfiltered and still active, flavours will continue to develop in the bottle. Goedemorgen is the Belgian term for “Good Morning”. Goedemorgen will be available at the Amsterdam retail store starting at 5:00 PM on Thursday April 4th in a limited run of 650 ml bottles, retailing for $9.95 per bottle.